After Several Challenges and lots of Stress and Frustration. Oh and even some Difficulty, the Root Z Brackets are now installed on both wings. This piece of work shouldn't have been such a hassle but it was for us. A combination of things contributed to the challenge almost like making this a perfect storm, but we got it done. I had to borrow a solid 1 inch flat rivet set from a friend which ended up working great, then the bucking bar underneath was difficult to work around the spar and the spar web from between the ribs. I am not super happy with the results either since the bucking bar nicked the spar web... I have already confirmed with the Van's Forums that Bekah and I have no issues here. Bucking the underside of those rivets was a pain, but we got it done and now the Z Bracket is in place and ready to support the Tank. Not much progress this week. Bekah has been a bit busy so haven't been able to rivet on the nutplates for the root Z-bracket. This pretty much stops any additional progress at this point. I have been able to set the tank on the left wing which gives a full wing view on the stand which is great. Also the alignment of the tank to the leading edge is really great without any modification. Can't wait to start drilling the tank to the Z-brackets and moving forward. I was able to start working on the left fuel tank but decided that I needed more clecos before starting the right, so will be ordering some from Van's shortly. Also, I am going to be going to Arizona for Halloween, so the bog entries and work will slow down a bit for the next week or so. I will probably get another session in before shutting down for the holiday but we will see. Bekah and I will probably rivet the nutplates to the spar for the root Z-Bracket. We tried today and had some big challenges, I need to borrow a non swivel flush rivet set to get the rivets in the corners, the swivel set just doesn't cut it here. So the left tank started with final deburring and fluting of the ribs, just like before. These ribs don't get primed because they will be inside the tank. I did end up cutting the tank stiffeners for both tanks and smoothed them all up. These guys go between the ribs on the bottom of the tank so that the skin doesn't sag due to weight of fuel., Here is a pic of them cut up. I read other web sites and determined that for the first assembly of the tank it was easier to start it outside of the leading edge jig and get a few clecos in place. I worked the upper and lower leading edge of the tank as everything began to take shape. Most people know that the tanks on aircraft are in the wings, but few know that the tanks ARE the wings. Basically this section of the leading edge gets sealed up with a sealant, and is the tank. Pretty cool and effective.. Almost finished with the Z Brackets. Both Wing's brackets are now primed and the nutplates are installed on the 6 inboard brackets. I have temporarily mounted them so that I can mount the tank and back drill the surface of the Bracket. The Root Bracket is bolted from the other side so the nutplates are attached to the spar. Here I have countersunk the rivet holes that hold the nutplates on. These guys are going to be a bugger to rivet, Bekah will need to shoot from the top and I will need to buck from within the ribs.. I think this is something that could have been done when the Spar was being prepared.. Note sure why the directions have you do it now.. If I were to do it again I would look to get these nutplates on when there weren't any ribs in the way. (Note: if you decide to put the nutplates on earlier in the process, you will need to drill the "root" Z-bracket first.) Also, some builders hold off on riveting the last couple root main ribs to allow for easier access at this stage. For those who need to know: Z brackets are used behind the tank to attach it to the main spar. The tank is bolted rather than riveted so that it can be removed if necessary. Side note: I have also finished match drilling both wings top and bottom as well as leading edges ! Wahoo.. Now its time to focus completely on the Tanks.. These guys will be a challenge and take some time but I look forward to it. Finishing up the drilling of both left and right main skins. Getting closer, but no pictures since it looks like what I have posted before. I am also starting to look at the Fuel Tank Z Brackets and am trying to figure these out. Lots of information here on the web and lots of different methods to work through this process. I think here I will look at the plans/manual and get familiar, but do it a bit differently as others have done. Dan Checkoway was one of the first guys to put up a site/blog of an RV-7 construction. He did an amazing job and had some great tips and tricks. I followed his site through the late 90's as he was working on and finishing his plane and was amazed at what it took to put an RV together. Dan, pulled his site due to personal reasons and I think the fame he got in the home built community became a bit intrusive, so I miss the opportunity to review it as I go. He had posted a way to work the Z brackets that others have followed with great success. Without his site I will kind of "wing" it from what I remember and from what others have posted and will try to go through it step by step for future builders.. Brad Oliver does a great job as well as other builder's sites I point to on my home page at showing this process. There are 7 brackets per wing/tank 6 standard and one Root bracket. The "root" brackets are the same but treated a bit differently and we will get to that.. First you have to place a pilot hole in the Z brackets where they attach to the main spar. This hole is #12 and is centered lengthwise on a flange, but offset from center 1/16th inch toward the web on the 6 standard brackets. On the Root bracket, this hole is centered lengthwise too, but offset 1/16th inch away from the web. The offset towards the web allows for better clearance from your rivet puller when attaching the 6 standard brackets to the tank with the blind rivets. On the Root flange, the offset away allows for better wrench access when mounting the bracket. To drill the pilot holes I set up a "jig" on the drill press to try and get the holes as centered and perfectly offset as possible. All the pilot holes are drilled, now I need to use some scrap bolts to anchor them to the spar as I match drill the rest of the holes. I went with the SafeAir1 Anodized aluminum pitot mast. It looks great and supports most pitot tubes. I will be using a heated pitot, but haven't settled on the final brand yet. This mast is definitely light in weight and the anodizing is good. I will put a coat of primer on it before it is fully installed. You start by using the template just outside of the last access hole. On the 7 you need to work past a rib, and make sure that you center the rivet holes behind the template. This puts the inside edge of the pitot mount about 3/4 inch to the outside of the rib. I used a combination of step drill and grinder to carefully cut the skin. Checking the mast all the time to make sure of a good fit. Once the mast fit through the hole, I match drilled the holes through the spar and to the back of the tube from the template. Note that only the rear two holes get countersunk because the three in the front fit behind the spar and it is the spar that will be countersunk. Today was kind of challenging as I installed the end rib in the leading edge and the flange that supports the tank when installed next to the leading edge. After the rib is in place you have to drill it from the bottom using the holes in the spar as a guide. Here I used a 12 inch bit and my right angle drill to make sure the rib was drilled straight. Worked well..
Once the bottom of the rib is clecod to the spar, you insert the flange between the rib and the skin and use the skin holes as a guide to drill the flange and the rib which don't come pre-drilled. You have to make sure the rib stays flush with the outer edge of the skin and the flange stays straight per the measurements provided in the directions. This part is challenging because for some reason the whole assembly wants to keep moving on you. I got it done and was happy with my results, but I think this is one of those tasks that you can do better each time you end up doing it again. Like I said earlier I would have let the rib stick out about a 1/16th of an inch so that the holes would be more centered on the flange. In my case they ended up real close to the web, but I was still able to get my dimpler die in there, so I think we are OK.
Friday after work I was able to move around some clecos and finish drilling the right wing. I match drilled the bottom in about an hour. Now time for deburring and dimpling as things move on. Somewhere along the way I read on a site that marking the clecos original hole makes it easier when you go to move them around after the first series of drilling. You can see in the photo that I use this trick and it is very helpful. Just put a tick next to the cleco, then drill all open holes. Move the cleco, then drill the holes wtih the ticks next to them. Works good and makes it so you don't miss a hole. Bekah is happy to see her wing labeled so there is no mistake..
Got another couple hours in and was able to Match Drill Rebekah's wing (right wing). At least the top of it is now complete.. Man are my hands sore from moving clecos around... I also was able to assemble the leading edge of her wing as well. Tonight I will work on match drilling the bottom of the right wing, then try to start working on my wing this weekend. Last night I was able to attach the rear spar to the wing stand and tighten it down once I confirmed the wing was plumb. I noticed that when adding clecos to the top skins, it was easier to start from the center and work out towards the ends of the wing. This process kept the skin in best alignment with the skeleton. Last night I did some misc stuff as well as worked on the left wing leading edge. First I was able to final rivet the right rear spar to the skeleton as it hung in the stand.. Now both Skeleton's are hung and final complete. I also temporarily hung the right wing walk doubler as you can see below. This will eventually go underneath the top skin at the root of the wing. This pic shows how it looks without the skin. Also, the pics below make it look like I am further along than I am, but they are pretty cool. I was able to create a cradle as the directions indicate to hold the leading edge skins and cleco the ribs into place. After that I simply cleco'd the leading edge assembly to the top left spar. I was concerned about clecoing the leading edge onto the ribs based on other builders sites/comments, but it went on really easy. In fact, you are supposed to remove the inside blue plastic first, but I placed the ribs in to see if the holes lined up and they did almost immediately so I threw in some clecos and kept going. I will probably pull it apart and remove the plastic before match drilling, but for now it looks cool.. In future posts you will see the Cradle/Jig I made to hold the leading edges in place while I cleco them. After the left leading edge was in place, I used reference lines I drew earlier to verify the tie down pilot hole and opened it up. Now the tie down can be inserted through the leading edge. Next steps are smaller steps that will take some time. First, I will need to secure the trailing edges of the wings to the stand, still haven't done that yet. Then loosen the skins and make sure the wings are plumb before I match drill the entire main skin section on both top and bottom. I will probably have the leading edge in place as I do this so that the wing can be as square and complete as possible while I am match drilling the holes. Also, the directions don't say this but I am going to keep both top and bottom main skins in place. I noticed that there is some sag in the spar if the bottom skins are in place. I want to drill the wing while it is in the most rigid straight position as possible. And at this point I get to start working on the pitot mast for the left wing. It is easier to get started on this now so that I can have a chance to work on it with the skins either on or off the skeleton. Next Step is the wing walk Doublers.. I was able to cut them both and temporarily installed the left one underneath the skin on the left wing near the root. The doublers are designed to make the wing stronger where you walk on it to get into the plane. You start by cutting some aluminum sheet which I think is probably wing skin scrap that Vans throws into the kit. Then you match drill using the skins as a guide. I slid the cut doubler under the skin and used clecos drilling directly into the plywood to hold the assembly tight and make for perfect matched holes. Below you can see the doubler between the skin and the wing root ribs. It is supposed to come right up to the rear of the main spar flange. Looks like it turned out pretty well.. I do have one gripe, all in all the directions were terrible for this piece of work and I am disappointed that Van's hasn't updated them. The pieces that you are supposed to use for the doublers are clearly identified, but the directions say that once cut to the exact measurements it is supposed to overhang the rear spar by 1 inch. You can see that it doesn't in the below shot. I have followed up and this is the normal set up, but sure makes you worry for a bit until you look into it. Rebekah and I worked Friday night and Saturday morning on riveting the ribs onto the Right Spar. This went quicker and easier than the left spar, so we finished and got the wing in the stand. I temporarily threw the skins onto the left wing. Immediately the wing became ridged and strong, even with the just the clecos holding it together. Its actually pretty cool how aluminum aircraft are engineered and how strong they really are. 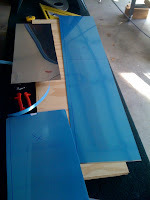 I started work on the wing walk stiffeners and will cover that in the next post. We got the left wing into the stand and it is looking good. I can't say that the riveting went perfect, but we got the job done and it does look good. There were two rivets that had to be drilled out for various reasons, but we recovered from our errors and the wing is solid. Looking down the top of the spar, it is exciting to see the structure together with no Clecos.. check out all them beautiful rivets. ! Also, very excited to get the wing in the stand permanently and take this gratuitous shot that is on all the other builder sites.. Looking through the lightening holes.. I haven't secured the rear spar yet, but initial checks with the plumb bob show this wing to have zero twist. As the skins go on, we will make sure to keep it that way. When building airplanes, any day you get to rivet is a great day since it means so much work is behind you. Tonight Bekah and I took our first crack at riveting in a while.. We did great ! Slow to start, but picked up speed and are now "current" again with riveting. We finished about 1/2 of the main ribs onto the left wing. We used a cardboard cutout to protect the spar from the bucking bar, and also set up a jig on the table to hold the bucking bar for the lower rivets. It left absolutely perfectly bucked rivets. Will show pictures of the jig (2x4 and cardboard. ;-) ) In my next post. Wing Ribs - Complete ! Deburring, Seaming, Fluting, Conduit/Wiring Hole drilling, Match drilling to Spars, More Deburring, Scuffing with Scotchbrite, Washing with dawn, Alumiprep Bath, Alodine Bath.. PPG Two Part Epoxy Primer... - DONE ! ! -These babies will NEVER be touched by corrosion..